Since 2012 80 wild elephants have been rounded up in Zimbabwe and then sold on to zoos in China. It is a violent process whereby babies, some yet to be weaned, are separated from their families forever. Their trafficking is not illegal, but it is cruel and inexcusable. The cruelty of the capture of baby elephants from their families in the wild has been revealed in disturbing photos and videos secretly taken in Zimbabwe last month, writes Adam Cruise. They show newly captured elephants being repeatedly kicked in the head. 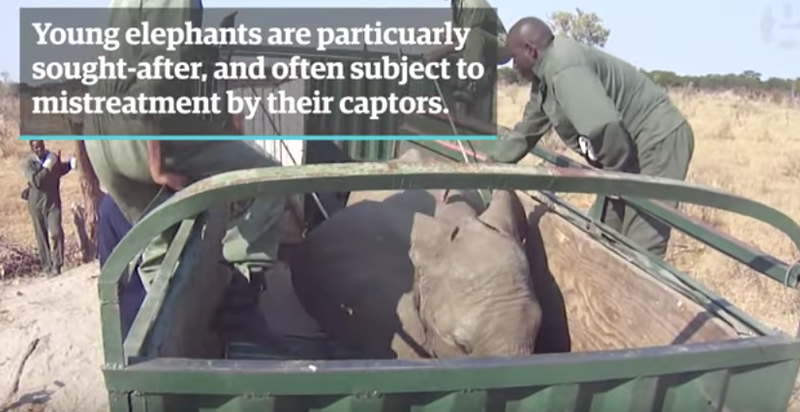 Since 2012, over eighty elephants (including last month’s batch of fourteen) have been captured from Hwange, Zimbabwe’s largest National Park and sold by the Zimbabwean Government to Chinese zoos. The process is both cruel and violent. 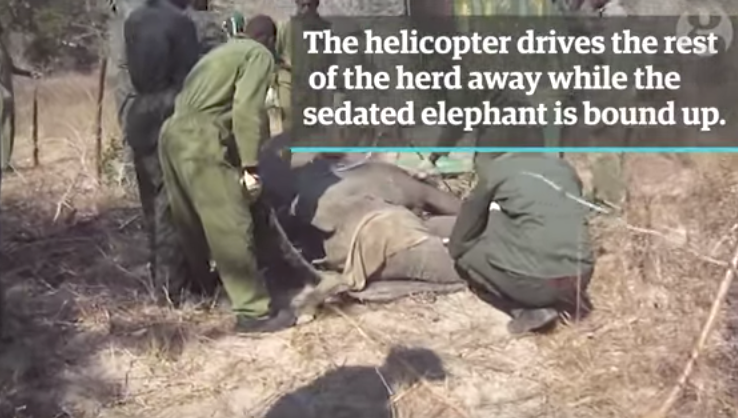 For the capture, a family herd is selected and a helicopter sent in to dart the baby elephants with tranquilizers from the air. As the young elephants collapse, the helicopter dive-bombs the distressed mothers to keep them away while a ground-team with trucks, tractors and trailers rapidly moves in to bundle the elephants into crates. The young elephants, some yet to be weaned from their mothers, were then moved to holding pens at an off-limits facility within the park. Here, as the video and photographic evidence reveals, they spent a few confused months terrified, underfed, and abused. From secret observations of the previous captures of live elephants, this latest batch, after a few months in the holding pens, will be transported in small crates by truck a 250 kilometers to Victoria Falls Airport. Here the elephants will be airlifted to China. Once there, they will be placed in quarantine before they are separated and shipped to zoos and safari parks across the country. In 2012, three young elephants died after arriving in China, and one died in transit during the flight from Zimbabwe to China in 2016. The actual captures are particularly brutal. According to internal reports from ZimParks, there was at least one death during the capture operation in 2016 presumedly after being crushed by the stampeding herd, while three very young elephants were severely injured during the captures in 2014 – one with a broken leg, another with a damaged trunk and a third with a damaged trunk and tail. Zimbabwe and China are not the only culprits in trading in live wild-caught elephants and other animals. The practice is legal under the Convention in the Trade of Endangered Species (CITES), the global treaty regulating international trade in endangered wild animals and plants. While there are now severe restrictions and bans in selling ivory worldwide, the trade in live wild-caught elephants is common, and largely unregulated. For example, CITES records show that nine wild-caught elephants were exported from Namibia to Mexico in 2012, six from Namibia to Cuba in 2013. In 2016, the United States imported 17 elephants from Swaziland despite objections from the public and conservationists. One of those young elephants recently died at the Omaha Zoo in Nebraska. According to a database kept by CITES, a total 537 wild-caught African elephants are currently held in captivity globally. Some 467 are in zoos, with 70 currently in circuses. Of the total number, 121 wild-caught African elephants are found in zoos in Europe, 144 in North America and in Asia there are 139. For circuses, the majority of wild-caught African elephants currently in circuses is in Europe with 48. The United States apparently has only 18 elephants still in circuses, after recent closures of the largest operation, Ringling Brothers. These figures exclude the 400 wild-caught Asian elephants traded globally. Under CITES, the trade in wild-caught elephants is poorly regulated and has few stipulations. All that CITES requires is that the zoos and circuses be deemed “appropriate and acceptable”, and the sale must benefit conservation of elephants in the home country. However, there are no criteria setting out what “appropriate and acceptable” actually entails. Nor is there anything detailing what “benefitting conservation” implies. Freyer says there is also no monitoring of the requirement that a sale will benefit conservation. Furthermore, the laws are entirely self-regulating. It is entirely up to the authorities in the exporting and importing countries to define and decide. In other words, the international legislation is entirely self-regulating. It is up to the authorities in the exporting and importing countries to define and decide how the elephants are treated and where they end up. Yet, even if the authorities of the exporting or importing countries find that conditions are not acceptable or appropriate, the sales may go ahead regardless. In 2015 and twice in 2016, an official Zimbabwean delegation travelled to various locations in China to assess the facilities. Seven zoos were visited and assessed. None were found to be appropriate or acceptable by the Zimbabwean delegation. However, their subsequent reports were ignored by Zimbabwe’s Minister of Environment, Oppah Muchinguri, and thirty-five young elephants waiting in the holding pens were flown in December 2016 to China. Muchinguri has repeatedly said the sale of the elephants is necessary to raise funds to take pay for the national parks in Zimbabwe. But, there have also been unconfirmed reports of the government using funds from the sales of elephants to pay off a debt . As more damning evidence of cruelty comes to light, conservationists, scientists and the public are beginning to question the legitimacy of the practice, and are calling for a change.